#LINO18 young scientist, Nataly Naser Al Deen, 27 from Lebanon, is a Ph.D. Candidate in her 3rd year in Cell and Molecular Biology at the American University of Beirut (AUB), Lebanon. 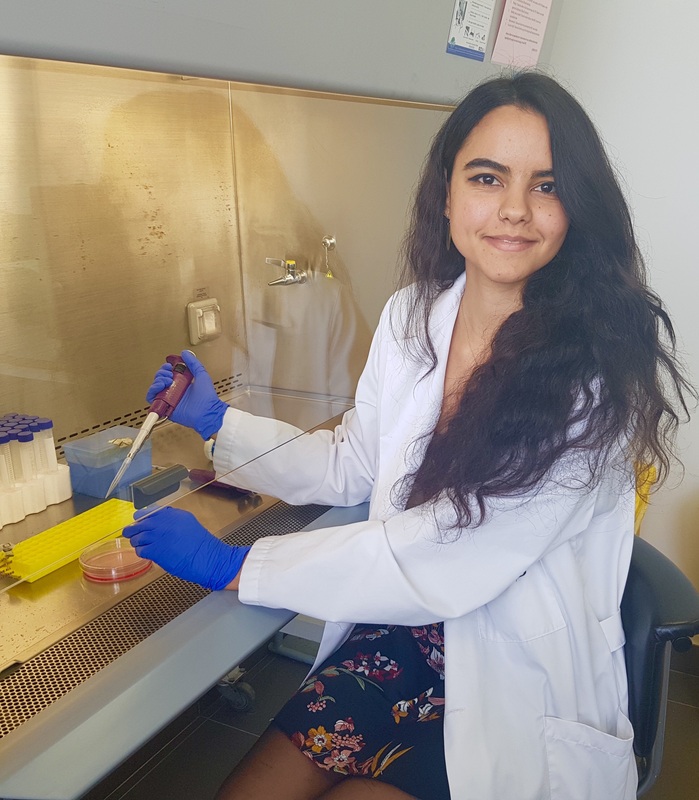 Her Ph.D. research project aims to delineate if microRNAs associated with disrupting breast epithelial morphology identified in young Lebanese breast cancer patients are involved in higher risk of early onset breast cancer. Her laboratory has previously profiled the miRNome and transcriptome of young Lebanese breast cancer patients compared to normal adjacent tissues and they are working on recapitulating the results in their breast cancer risk progression series 3D culture system and gradient-on-a-chip technology, by characterising the corresponding miRNome, transcriptome and signaling pathways through miRNA-and-mRNA-sequencing. This project will bring initial information on whether microRNAs (miRNAs) associated with morphological disruptions of the breast epitheliumacini and identified in young women with breast cancer are involved in higher risk of early breast cancer onset. It will improve population health outcomes, notably in women, by providing proof-of-principle of how data from populations at heightened breast cancer risk in Lebanon, under critical environmental and socioeconomic conditions, can help primary prevention research. Enjoy the interview with Nataly and get inspired! With my mother working at the Lebanese Red Cross and my uncles working as a neuro-surgeon and a medical lab physician, I was always fascinated with science and medicine as a child. I was impressed by their work and wanted to impact the medical and research field myself. Growing up, I remember the library at my grandparents’ house with medical and biology books that belonged to my mother and maternal uncles. I used to flip through the books with fascination, looking at images that seemed like magic to me. I have always had a fervent interest in perusing a medical degree, but after attending the American University in Cairo, I discovered my love for research and academia. I undertook my first research project in 2011 during my semester abroad at the University of South Carolina, USC. Upon my return to Cairo, I took an oncology course at the Paediatric Cancer Hospital. I knew then that a career in cancer research was my calling. 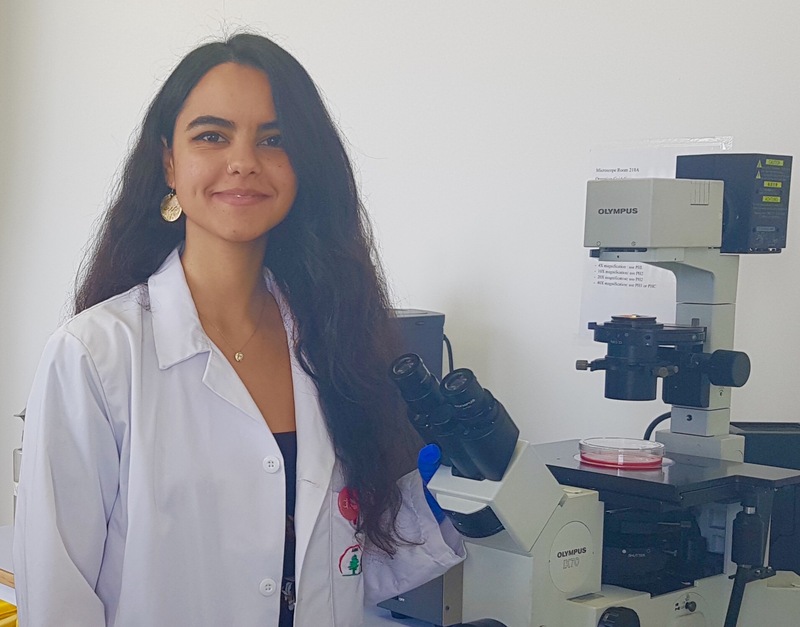 I conducted my undergraduate senior research project at Theodor Bilharz Research Institute, TBRI, on hepatocellular carcinoma on “YKL-40, a Novel Non-Invasive Biomarker as a Predictive and Prognostic Marker for HCV-Induced HCC” under the supervision of Dr. Suher Zada at AUC. I then pursued my master’s degree in Tumour Biology at Georgetown University in D.C., and I am currently pursuing my Ph.D. degree at the American University of Beirut (AUB) in Cell and Molecular Biology. • Dr. Rihab Nasr (my Ph.D. co-advisor), who is an Associate Professor at the Department of Anatomy, Cell Biology and Physiological Sciences and the Director of Cancer Prevention and Control Program at the Faculty of Medicine at AUB. She is also the founder of Amalouna, an NGO at AUB that aims to spread awareness on cancer research and cancer prevention. 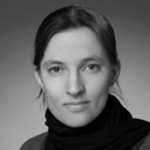 • Dr. Sophie Leleivre (our collaborator) who is a Professor of Cancer Pharmacology, at the Department of Basic Medical Sciences, College of Veterinary Medicine. She is also the Coleader for the International Breast Cancer & Nutriton (IBCN), a global research-based initiative that targets primary prevention of breast cancer through collaborative scientific efforts. • Dr. Priscilla A. Furth, a Professor of Oncology & Medicine and the Associate Dean for Faculty Development at Georgetown, who runs a physical fitness clinic for breast cancer patients, survivors, and those at risk. Because of her, I was inspired to create my own exercise health initiative for breast cancer survivors in Lebanon three years ago called “Pink Steps”. It aims to promote physical fitness and a healthy lifestyle in breast cancer survivors in Lebanon. And of course, I am forever grateful for all the support and guidance that my Ph.D. thesis mentor and advisor Dr. Rabih Talhouk, a Professor in Cell Biology at AUB, has continuously provided me with. I admire his vast contributions to the breast cancer research field over the years and his dedication as a member of the IBCN research network. It all started when I was 15 years old, when I was awarded the Kennedy-Lugar Youth Exchange and Study (YES) scholarship. I was granted the opportunity to live in Hawaii with a host family and attend Hilo High School for a year, as an exchange student. My eagerness for excellence did not stop there, and I was determined to continue my hard work. I was then awarded the Middle East Partnership Initiative- Tomorrow’s Leaders (MEPI-TL) Scholarship in 2009 to pursue my Bachelor of Science at the American University in Cairo, where I pursued a degree in Biology (pre-med), and minors in chemistry and psychology and conducted my thesis on hepatocellular carcinoma under the supervision of Dr. Suher Zada. 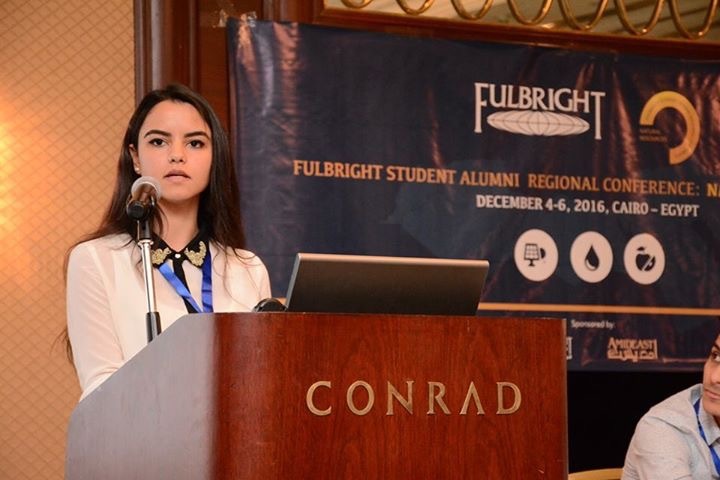 After AUC, I was awarded the prestigious Fulbright Foreign Student scholarship in 2014 where I attended the Georgetown University Medical Centre in Washington D.C. and pursued my master’s degree in Tumour Biology. I was very proud to be part of Dr. Rebecca B. Riggings’ team at the Lombardi Cancer Center. Our work focused on the therapeutic targeting of the ETS family with the small molecule YK-4-279 as an effective strategy for the treatment of Triple Negative Breast Cancer, TNBC. My part in this joint research project was to test whether YK-4-279 is more efficacious in the absence of functional p53 in TNBC. After I graduated from Georgetown in 2015, I knew that pursuing my PhD studies at the American University of Beirut was the ideal environment to strengthen my passion for research and enhance the depth of my knowledge. I was privileged and delighted to join Dr. Rabih Talhouk’s team, in collaboration with Dr. Rihab Nasr’s team at AUB, who are both members of the International Breast Cancer and Nutrition, IBCN network, with our collaborator at Purdue University Dr. Sophie Lelièvre (one of IBCN’s leaders). This gave me the honour of becoming an IBCN member. I am currently working on “microRNAs Dysregulated in Early Onset Breast Cancer in Lebanon and their Association with Loss of Morphogenesis of Breast Epithelium in a 3D Culture Model” as my Ph.D. thesis project. This is of high importance, especially because breast cancer incidences among young premenopausal women in Lebanon are alarming, with 22% of cases diagnosed in patients under the age of 40, compared to the 6% observed rate in Western countries. I have enjoyed working on all of my previous research projects, including ones that focused on hepatocellular carcinoma, triple negative breast cancer and early breast cancer. However, my Ph.D. thesis work is of particular interest to me. I am learning a lot about miRNAs and their regulatory and biomarker functions, and currently, we are working on two collaborative side projects with the University of Toronto and Purdue University, respectively. These are adding new layers to our understanding of the interaction of miRNAs with key regulatory molecules (like circular RNAs) and the role of oxidative stress in facilitating tumourigenesis. Being awarded various scholarships that fully supported all of my higher education thus far has been my greatest driving force for me to achieve more and give back to my community and the research and scientific fields. I have always felt immense pride in belonging to many prestigious alumni communities. Being amongst the KL-YES scholars, MEPI-TL scholars, Fulbright Scholars, and now, of course, being a member of the Lindau Nobel Laureate Alumni network is one more reminder to me to always dream big and pursue all my career goals. What is a “day in the life” of Nataly like? Well, usually I am more of a night owl, so on week days, I go to our laboratory in the morning, have my coffee and catch up on my emails, then I proceed to perform my planned experiments for the day. We usually have lab meetings, skype calls with our collaborators or discussions between lab members, so I try to plan that during the experiments’ incubation periods. I also teach introductory to biology laboratory, as part of my graduate assistantship duties once a week. When we have a deadline for a grant proposal or if we are writing a review book chapter or if I need to perform some bioinformatics analysis or dry-bench research, I work on them mainly during the weekends and sometimes I try to catch-up on work during weekdays as well. After I am done with my day at the lab, usually around 7-8 pm, I try to get in my daily exercise by going to the gym with my friends from other laboratories, then I head home and cook dinner and finish working on any dry work/writings (usually till around 1-2 am). After I obtain my Ph.D. degree, I would like to continue in the cancer research field and academia and pursue a post-doctoral fellowship. I want to make an impact in the cancer research field, mainly through basic and translational research, and teach courses in oncology, and hopefully later have my own research team. However, I am fully devoted to my academic and professional responsibilities and I feel responsible for my community and the Alumni networks that I am part of. Thus, as a dedicated activist for breast cancer research and prevention, I dream of expanding my exercise health initiative for breast cancer survivors (Pink Steps) to other countries and establish it as an NGO. When I am not doing research, I like to spend my time on sports activities, dancing, hiking, and most importantly, I dedicate my free time on weekends to my “Pink Steps” initiative. A cause that is very dear to my heart is empowering women, especially female cancer survivors. Thus, I combined both my passions for cancer research and sports into founding my own exercise health initiative for breast cancer survivors in Lebanon called “Pink Steps”. 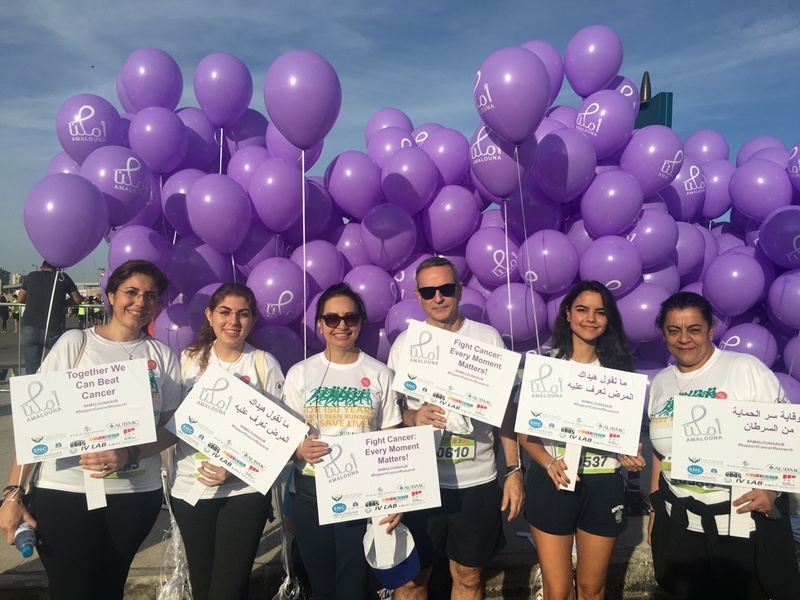 Pink Steps aims to promote physical fitness and a healthy lifestyle in breast cancer survivors in Lebanon. It was generously funded in 2015 through a Fulbright Alumni Community Action Grant, by the U.S. Department of State’s Bureau of Educational and Cultural Affairs. Pink Steps is designed to increase the fitness level in survivors through daily walks (10,000 steps/day) performed at home or work, which are monitored through pedometers. 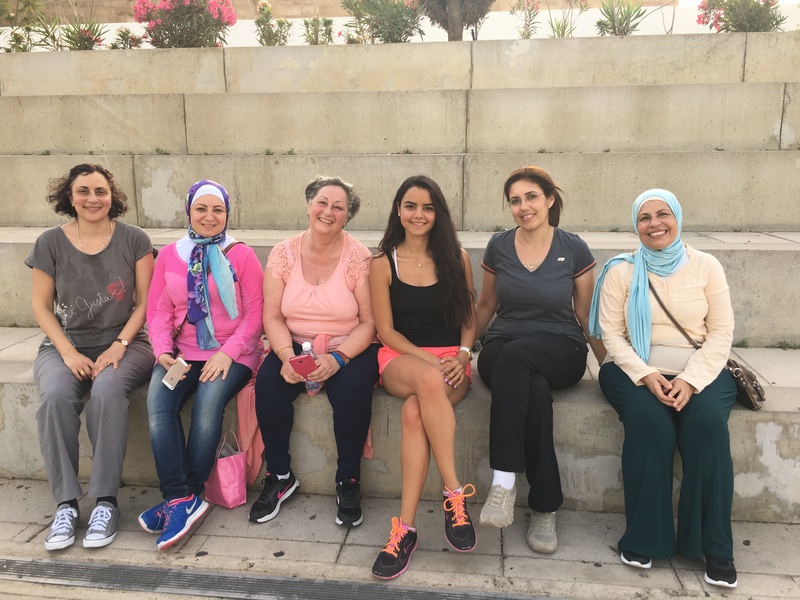 Every Saturday, we meet for a group supervised walk at the American University of Beirut (AUB) green field, along with a session of yoga, Zumba, belly dancing, or core exercise. We also have nutritionists that offer dietary advice and food safety sessions, and we sometimes hold support group sessions such as stress-relief sessions, rebirthing/breathing exercises and mental health and wellness reflection sessions. Pink Steps has fostered a safe community for empowering female cancer survivors (especially breast cancer survivors), who have a common goal: to increase and improve their quality of life in order to combat cancer and prevent recurrence. Pink Steps is working to challenge the misconception that cancer patients should not exercise or be physically active. On the contrary, they need to exercise and eat healthier to feel stronger and fitter. I feel responsible for affecting a wide-scale change in my community, and this is just the beginning. Our family has been growing for the past three years, and we will make sure to keep on empowering more and more female cancer survivors who join our cause and help them lead a better and healthier lifestyle. I salute every single woman in science that has paved the way for all of the current female scientists and physicians to contribute to the countless accomplishments in the STEM field, and I encourage every single aspiring woman who is passionate about science to pursue her dreams to the fullest. I have great pride in every female in science. I really do not think we should give women any different advice than we give to any person interested in persuing this career. Believing in absolute equality, my only advice would be to follow your scientific passion, find what drives you in science and in aiding others, give it your all, and believe in yourself and your capabilities. On a daily basis, we witness new breakthroughs in science and medicine, which help save lives and eradicate certain diseases. I believe that the new breakthroughs in science and medicine are leaning towards devising techniques and making use of big data and high-throughput analysis to characterise biomarkers for early detection/prevention of cancer through personalised medicine, liquid biopsies, cancer vaccines and tailored interventions for cancer prevention. I am beyond proud of all the great accomplishments and efforts that are done in the STEM field by many influential and dedicated young-and-established women in science. I am a strong believer in women’s scientific power in our current time, and I keep on hoping for the number to grow exponentially. From my experience at various educational institutions, both in the Arab world (Lebanon and Egypt) and in the U.S., I have enjoyed witnessing the majority of current graduate students (at least in the biological and cancer research field) being dominated by ambitious and hardworking female scientists. Being granted equal access to science, research and grant money, whether at the graduate or professorship level, is the key to ensuring more participation and contribution for women in science.